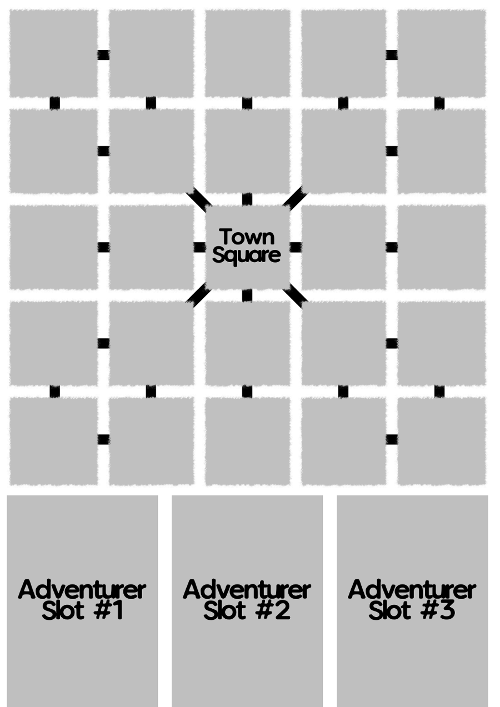 Time for more thinking on our print-and-play game tenatively titled Adventure Town. What I know I have is a game loop. I know what I want the play experience to be for the players. One player rolls a handful of dice, and the dice are drafted; players convert those dice into currency, either by a direct conversion or using a detail on their board, showing which dice they took and what they used them for. Then, players can spend coin on their turn to build things in the town. I want a key player to roll some dice, then I want the dice drafted; the player who rolled them gets the biggest share, then the next player gets fewer, then hopefully the next player gets fewer and fewer and so on. I want this number of dice to be large enough that it’s hard to ‘hate’ draft – if you’re passing five dice, you can’t really rely on taking away the one die someone two seats away might want. I want players to care about what happens when the dice are rolled, but not stress too much about what other players are doing except in a general sense. I want people to care less about individual short-term actions, and more about what they see their opponents trying to do. I want players to feel like they’re in charge of something. I see them as representing a group, but also making changes to the town as the game goes on. This could make them big and wealthy landowners, but if they were, why would they be hanging around in podunk nowhere? Seems better to have players represent groups – maybe family businesses, investors, workers, cults and guilds. I want players to have their own play space, and I want them to have a common board space. I can use the common space to track things that people do to affect everyone – in this case, I want them to play and deal with the idea of the town space to see players marking territory and claiming ground. I don’t want the town board to lock options off from players, though – so I don’t want buildings to be only usable by the people who build on them. I want the building of a building to be a little bit of an event. I want players to recognise that they’re doing something that’s kind of cool, and maybe get to mark it, or sign it. I want the game board to change. I don’t want to remove buildings that are already in place, though, because that seems to represent a traumatic destruction of the board. Also, players are mostly interacting with the board with pens or pencils, which don’t show destruction as easily as they do creation. Even a big ole x through a square can be missed by comparison. I want there to be some feeling of procession through time. So with the desire for board change as well, I think I want to create the feeling people are moving through the town. With these wants in mind, here’s an example of the ‘town’ board I have in mind. This design means that each turn, from the deck of adventurers, three adventurers arrive, and they trigger things in town. This means each turn cycle has players doing things, building an investment in the town, and then adventurers turn up, and the town does things based on those investments. This could, if I do it right, play out a bit like Machi Koro, except instead of rolled dice, it’s a sequence of adventurers. This might wind up being too tight! I might decide to make the town squares bigger, and not include a space on this board for those cards. I may not need 3 slots, or I may need more than 3 slots. After all, they don’t need to be on the board, and the deck won’t have room to live on the board. The town squares might be too small at a glance. I might have too many town squares. 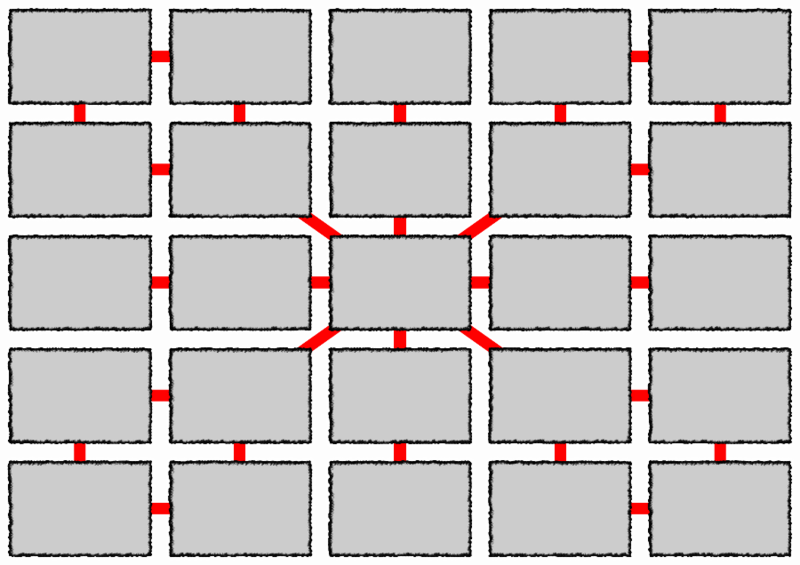 I might want to make it a 9×9 or 4×4 grid, or maybe get a little odder, with some buildings occupying multiple squares, perhaps signifying their importance. I might not want there to be a tree relation between spaces. As it is, I put in the lines to give myself a vague idea of what I was doing, but it’s by no means essential.